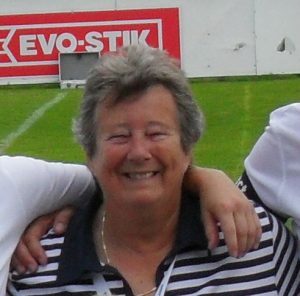 Sylvia Gore, the “Denis Law of Women’s Football” has died aged 69, from cancer. Sylvia was a pioneer of the women’s game, once scored 134 goals in a single season and scored the first ever goal scored by the England Women’s team in a 3-2 victory over Scotland. Sylvia was born in Prescot, Merseyside, to a footballing family. Her brother and Uncle both played for the local club and while they encouraged her to play, the headmaster at her school prevented her playing in the school team. Sylvia played football at a time when the Football Association banned women’s teams from using FA registered pitches. The FA held the view that football was “quite unsuitable for females”. In fact the ban was more likely due to the massive popularity of the women’s game in the early years of the 20th century and they feared it could rival the men’s game. In the UK women played on rugby grounds, public playing fields and recreation grounds but while playing for Manchester Corinthians Sylvia travelled the world, played on proper pitchesand in front of massive crowds. My first memory of Sylvia was when, in 1974 Fodens, originally a works team from the Edwin Foden, Sons & Co. lorry manufacturing plant in Sandbach, beat Southampton in the final of the Women’s FA Cup. I moved to Congleton, just 5 miles from Sandbach from Great Sankey, just 5 miles from Prescot, in 1974. When her playing career ended Sylvia coached the Welsh National Team and became the first female director at the Liverpool County Football Association. She was inducted into the National Football Museum Hall of Fame in 2014.